The GSM Cutter is a textile testing instrument which is used for measuring fabric GSM with the aid of a weighing scale and GSM pad. The GSM cutter is a circular fabric sample cutter. With this instrument, a uniform circular fabric is cut without measuring. 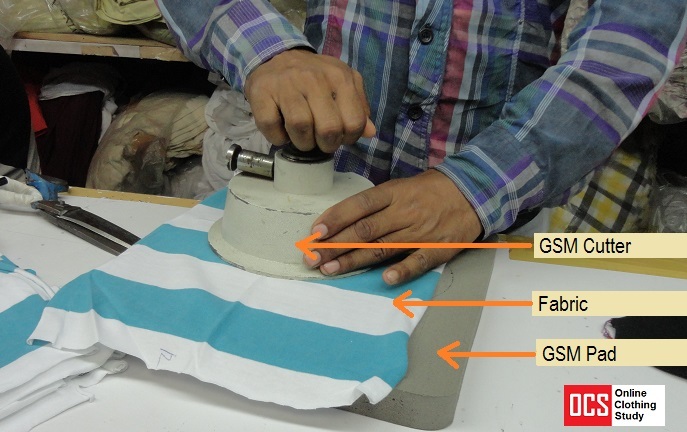 Area of the fabric specimen cut by GSM cutter is 100 square centimeter areas. The instrument is equipped with a set of four replaceable blades and normal cutting pads. To measure the fabric gsm accurately GSM cutter is useful. Fabric gsm is one of the important fabric qualities, based on which fabric costing and fabric quality, is determined. A GSM cutter can be used for cutting fabric specimen for any types of fabrics for checking the fabric weight. The depth of cutting up to 5mm. The weight of the circular fabric specimen is in grams. The resulted weight (grams) of the specimen is multiplied by 100 to get the weight in grams per square meter (GSM). How to Find Fabric GSM without GSM Cutter? Online Clothing Study: What is GSM Cutter? An introduction to GSM Cutter, the instrument widely used in the garment and textile industry for measuring fabric weight in garment per square meter (GSM). Application of GSM cutter.